During the Summit of Madrid (2010), and thanks to the support of the WIDE network, a space for transnational feminist dialogues between women’s organizations in Europe and Latin America was created. With the aim of pursuing this strategic collaboration, the women’s group of the Hemispheric Social Alliance invites WIDE+ to be part of the coordination and organisation of the Another Economy is Possible Workshop. The workshop will be held during the forthcoming summit of the peoples to be held in Chile, January 26-28. The Peoples Summit runs parallel to the official EU-Latin American Summit of Heads of States. The main goal of the workshop is to share and discuss current proposals from women’s organisations aiming at deconstructing the fundamental tenets of the neoliberal capitalist model – the accumulation of private capital by élites, the depletion of nature’s resources for profit-based development, the multiple social hierarchies it (re)produces, and the discriminatory division of labour it perpetuates. In the same way, the women’s gathering seeks to identify alternative paradigms being put forward by women from different sectors and core groups. Our goal is to identify commonalities and differences in the alternative paradigms that we are currently building and promoting. Some of the paradigms we have identified and which we intend to address from a feminist perspective are: feminist solidarity economy, food sovereignty and care economy, el Buen Vivir. All these from the distinct standpoints of diverse women (indigenous, obreras, trade union leaders, afro-descendants, women within LGTTB groups, coalitions of women farmers and peasants, etc) . The Women’s Goup of the Hemispheric Social Alliance (HSA) is at the same time part of the Bi-regional Europe-Latin America y the Caribbean Enlazando Alternativas Network and supports the Stop Corporate Power global Campaining. The shift towards a new financial architecture. Development driven by social justice (economic, environmental, gender justice). This means people-driven development policies that enforce human rights (individual and collective rights). This includes the right to water, housing, public services and the right to health, amongst others. This rights-based framework should aim at achieving the right to Buen Vivir. Create mechanisms for women to exercise their full citizenship: the right to have a say, access to legal justice. Recognise the plurinationality of Latin American societies and promote participatory democracy, enabling the construction of a people-driven socioeconomic model that acknowledges the contributions of women. Recognise women’s contribution to the care economy. This means promoting labour legislation that ensures gender equity, so that obstacles to the incorporation of women into the labour market on equal terms with men are removed. Enforce legislation so as to ensure stable jobs and decent wages for women, with access to social security and labour rights. Eradicate all forms of discrimination and sexual violence against women. Support Trade Unions, for they are crucial to defend the rights of workers. Demand the promulgation of a General Law of victims and the law to protect human rights defenders. Strengthen the continental articulation of women in Latin America from the women’s Committee of the ASC and other networks in the region. Enhance the process towards building a feminist solidarity and popular economy as an alternative to the neoliberal economic model. Contribute to the debates and organisation of the People’s Summit of January 2013. Participants to the G20 from a Feminist Perspective, Mexico, June 2012. 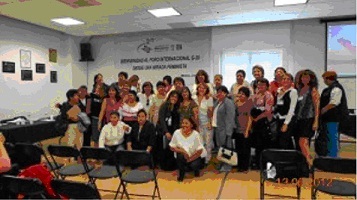 After the successful meeting in Mexico, a few members of the Women’s Group of the Hemispheric Social Alliance met in Santiago (September 26). The main objective of the meeting was to discuss preparations for the women’s Conference with the Chilean organisations that will host the Summit of the Peoples. And Paulina Muñoz Samaniego, the Coordinator of the Group, met with Bárbara Figueroa, a well-known leader who was recently elected President of the president of the Chilean Trade Union (CUT). The meeting was also attended by the CUT’s Gender Expert. The CUT women leaders expressed their support to the event and intend to take an active role in its preparations. The meeting was also attended by several local women’s organizations (professional women’s networks, migrant, indigenous and women farmers organisations). Members of the Women’s March and ANAMURI (women’s branch of Via Campsina) also atended and expressed their political support to the whole event. Overall, there is growing enthusiasm en interest amongst Chilean and Latin American organisations. We are waiting for a detailed de briefing from Muñoz Samaniego. The women’s group of the Hemispheric Alliance hopes that WIDE Plus members, as well as other women’s organisations based in Europe, can join and take an active role in the preparations of the workshop. International: Secretaría Alianza Social Continental, Laura Rangel, based in Colombia, and Comité de Mujeres ASC, Paulina Muñoz Samaniego, based in Ecuador. Bolivia: Julieta Paredes, Assembly for community-based feminism. El Salvador: Karen Ivonne Hernández Vides, Red Sinti Techan – y Martha Benavides -EFTF/GCAP. Honduras: Liana Lisset Funes Girón, Centro de Estudios de la Mujer-CEMH (partners of the Central American Women’s Network (CAWN, London). Guatemala: María Teresa Calderas Teo, Fundación Guillermo Toriello, y Norma Maldonado the Gender and Food Sovereignty Network. Nicaragua: Martha Beatriz Flores Recinos, Intipachamama. Ecuador: Blanca Chancosa Movimiento Indígena CONAIE y Paulina Muñoz Samaniego, Plataforma por los Derechos de las Mujeres y Ecuador Decide, and Colectivo de Género Acción Política. Peru: Rosario Romero Banda, Forum Solidaridad. Mexico: Leonor Aída Concha, Red Nacional Género y Economía; RMALC, Red Mexicana de Acción Frente al Libre Comercio, Comité de Mujeres ASC Capítulo mexicano, and Frente auténtico del trabajo, Beatriz Luján. Colombia: Red Colombiana de Acción frente al Libre Comercio RECALCA. Tribunal Mujeres y DESC, punto focal de CLADEM; Fundación para la Formación de Líderes Afrocolombianos, and AFROLIDER. Spain: Movimiento M15 Pepa García. WIDE +: to be confirmed. Contacts have been established via Paty Muñoz Cabrera. Patricia Muñoz Cabrera, a WIDE+ member and gender consultant. Posted on October 30, 2012 July 5, 2017 by wideplusnetworkPosted in Feminist Economic Literacy, Feminist Solidarities, Meetings and WorkshopsTagged (Socio-)Economic Alternatives, Feminism in Action, Feminist Economic Literacy, Latin America. Next Next post: Women’s Rights and the Post-2015 agenda: the time is NOW!